Yelling Stop: "Fat Mice and the Laws of Thermodynamics"
"Fat Mice and the Laws of Thermodynamics"
"At the end of first experiment (four weeks), the calorie-restricted mice weighed a teeny bit less than their free-eating counterparts — the difference was not statistically significant, but it was there. However, the calorie-restricted mice also had 68.5% more fat mass, and 12.3% less lean mass. "Being put on a diet made them fatter. "At the end of the second experiment (three weeks), the average weight for both groups was virtually identical — it was also virtually identical to their baseline weights. But the calorie-restricted mice had 43.6% more fat mass and 6.4% less lean mass than the free-eating control mice. Once again, being put on a diet made them fatter." Now, before you go saying that this only applies to mice, I'm in the middle of reading Good Calories, Bad Calories , Gary Taubes' opus on human obesity and diet, and this behavior is perfectly consistent with behavior seen in humans. Click image for the data. This is also perfectly consistent with human economic behavior: it's perfectly rational. 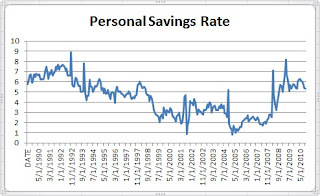 The savings rate in the United States had been declining for years. But it recently turned drastically upwards. What happened? The US had a recession: peoples' incomes were put on a diet. So what happened? As you can see in the chart, they cut back on expenditures, and started saving vigorously. They were storing up just like the mice were, and it's a perfectly rational reaction either way. Since neither us nor the mice can predict the future, the only rational thing to do is to react to changing conditions. The mice (and us) interpret a diet as "lean times", and start saving. Here's the study Naughton discusses. "The correct numbers are even more interesting than the ones I made up. Even in the high-sleep group, nearly half the body weight lost by simple calorie restriction was lean mass. That doesn't make calorie restriction look very good! "In the sleep-deprived group, 80% of the weight lost by calorie restriction came out of lean mass. Ouch! "That illustrates one of the reasons why I'm skeptical of simple calorie restriction as a means of fat loss. When the body "wants" to be fat, it will sacrifice lean mass to preserve fat tissue." "Why Bacon Is A Gateway To Meat For Vegetarians"
"'On the Move' Gets Harvard Going"
"...The Very Latest Fitness Trends"
The Evolution Of Man In "The Economist"
Review Of "Why We Get Fat"
Persistence Hunting: Can It Really Be This Easy? Lindsey Vonn On A Paleo Diet? "First Impressions - Altra Adam"